This year we are celebrating 100 years of Cubbing . In the build up of Akela 2016 we are interviewing Cubs and Alumni. 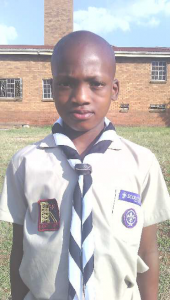 We spoke to Aobakwe Motuba (10) from 1st Ikageng Cub Pack in the North West. Cubbing is fun because I do lots of things with my friends in my Pack and we learn new things we didn’t know before. My best experience was when I made a kite and flew it in the sky, it was brilliant! The weirdest thing I ate was apple tart. I didn’t know there was such a nice thing until I made it myself and it was so nice! 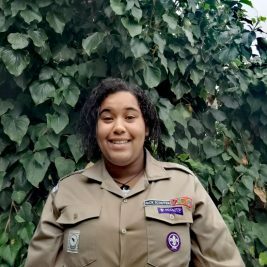 The toughest challenge was when I helped the senior Scouts with pioneering gadgets and the things they tied were hard for me to make. The most amazing place I visited was the University Botanical Gardens and our local museum. I learned about the jungle book, Cub promise and law, the grand howl and the reef knot. I helped clean up a heritage site and we played heritage games. I taught my mum how to use matches and how to take care of our shoes. Someone who loves, jokes and plays with us and always takes care of us. He is special because he loves to play games with us and he teaches us about Cubbing. Cubbing Rocks because … it makes us tough! Generally being with the other Cubs is amazing! By being a Cub I learnt to believe in myself!